In the 26th century, an attempt to terraform Mars for Earth’s overcrowded human population has led to a planet with a breathable atmosphere but an infestation of cockroaches. A varied crew of criminals and desperate civilians undertake special genetic engineering to make them better suited to exterminating the insects. On their arrival on Mars, however, they discover the cockroach menace is far more evolved than they had been told, and a hidden agenda may spell the death of them all. 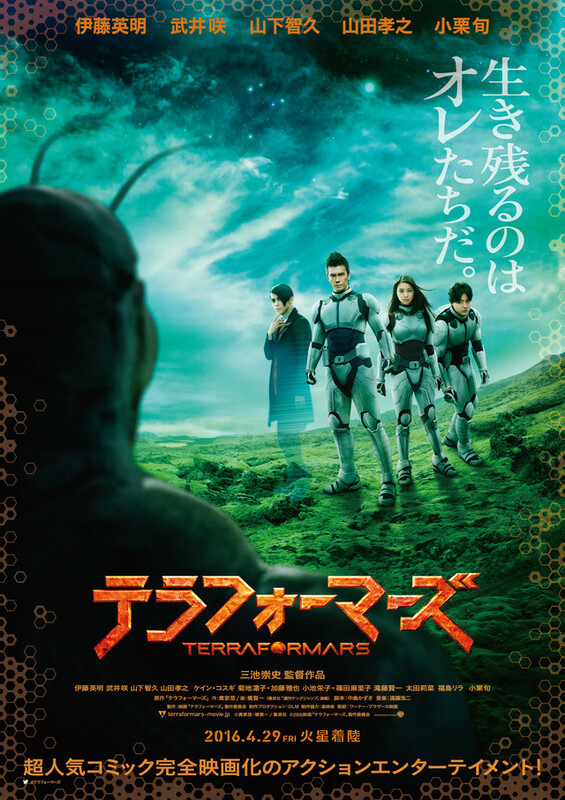 Terra Formars is a 2016 live-action adaptation of Yu Sasuga and Kenichi Tachibana’s popular science fiction manga. The film has been directed by cult favourite director Takashi Miike, whose wildly eclectic career is packed with unexpectedly brilliant gems: disturbing thrillers, ridiculous comedies, emotionally driven samurai dramas – you name a genre, and Miike has probably directed a dizzyingly effective film about it. Sadly his specific talents seem to have taken a vacation with Terra Formars. It is a bad film, but worse still it seems an oddly boring one too. It represents everything that does not work with contemporary anime and manga adaptations without bringing along anything else to make the experience worthwhile. The end result is something I honestly never thought I would see: a Takashi Miike film not worth watching. Part of the problem is the source material: Japanese filmmakers constantly struggle with adapting long-form manga to live-action because there’s simply no room to fully adapt 20-plus volumes of a manga into a single narrative feature. Filmmakers are left to either compress the story terribly, cut out masses of plot critical material, or simply adapt as much as fits into two hours and pray for a sequel. None of those options are terribly ideal, but the fourth – to simply adapt the pre-existing material into a new form that does accommodate a two-hour running time – seems to be entirely off the Japanese film industry’s radar. Terra Formars takes option three: things essentially happen until the film is out of time, and matters are left in a deliberately open and sequel-baiting fashion. What plot there is for the film is essentially this: some reluctant people agree to travel to Mars in exchange for vasts sums of money upon their return. To travel there they are forced to undergo life-threatening surgery. Once they arrive on Mars they learn that they were lied to: the cockroaches have evolved into enormous brown humanoid killing machines, and the surgery has allowed the human crew to transform into a variety of insect-human hybrids with exaggerated super powers. From there the film is essentially a series of fight scenes with a messy body count until enough humans have died for the survivors to make their last-minute escape. To be honest there is something slightly ill-conceived about a group of soldiers from a developed nation travelling all the way to Mars to kill en-masse the dark-skinned indigenous population. Had it at least been deliberately conceived as a social comment Terra Formars might have gotten away with it, but as far as I can make out it is simply an unintended and unacknowledged elephant in the room. The film is an egregiously obvious hodge-podge of science fiction influences, including Blade Runner, The Fifth Element and Starship Troopers. Some of the technology design is reasonably attractive. The humanoid Martian roaches are oddly goofy-looking. The human-insect hybrids look ridiculous, as if they have walked onto the set from a nearby Super Sentai knock-off. Collectively it makes the film seem terribly unconvincing and silly. More than any of these factors, however, the greatest failure of Terra Formars is its inconsistency of tone. When Miike embraces the ridiculous nature of the story and indulges in its silliness, the film becomes fitfully entertaining. When it tries to take the material seriously – which is much too often – the entire film collapse under the weight of its own farcical set-up. Had Miike approached the material in a similar vein to his earlier anime adaptation Yatterman, or even his yakuza comedies Undercover Agent Reiji, Terra Formars might have been some kind of wonderfully stupid treasure. As it is, it’s a weirdly appalling and unlikeable mess.